Exciting News: This is just one of a bunch of Whole30 Recipes here at The Nourishing Home. PLUS I’ll be sharing even more Whole30-friendly recipes and FREE Whole30 Meal Plans as part of The Ultimate Whole30 Success Guide! As I’ve made my way along the grain-free path, I’ve often found myself craving rice. Honestly, it’s been the only grain that I miss. So when I discovered lots of grain-free foodies turning cauliflower into “rice,” I must admit, I was a bit skeptical. But thank goodness my curiosity was greater than my doubt, because I truly enjoy this newfound alternative! In fact, I’ve been having lots of tasty-fun creating my own versions of cauli-rice like this highly versatile, yet simple, seasoned cauliflower rice dish. So if you’ve been on the fence about trying cauli-rice too, let me assure you – it’s absolutely delicious, nutritious, and really easy to make! Place the core face up and then carefully use a sharp knife to cut in a circular pattern around the core. 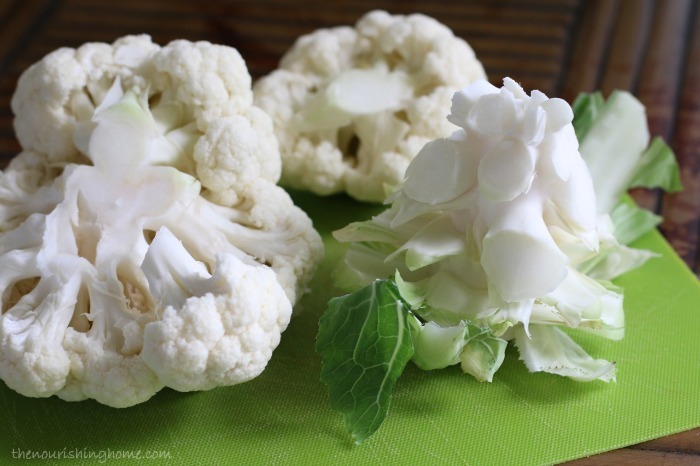 Removing the core makes it much easier to cut the cauliflower into even-sized florets. 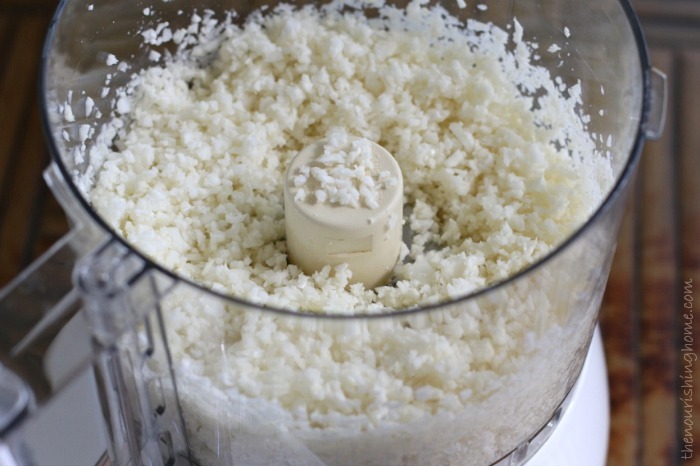 Place half of the cauliflower florets into a food processor. Cover and pulse until the cauliflower resembles rice grains. By slowly pulsing the cauliflower, you will be able to carefully monitor your progress in reaching grain-sized pieces. For those of us who’ve been missing rice, cauli-rice is a dream come true! You simply won’t believe how delicious cauli-rice is until you try it for yourself. It’s mild flavor and rice-like texture makes it the perfect addition to any meal that calls for rice. Ready to give cauli-rice a try? Below you’ll find my simple seasoned cauli-rice recipe. It really is a delicious grain-free alternative to rice! 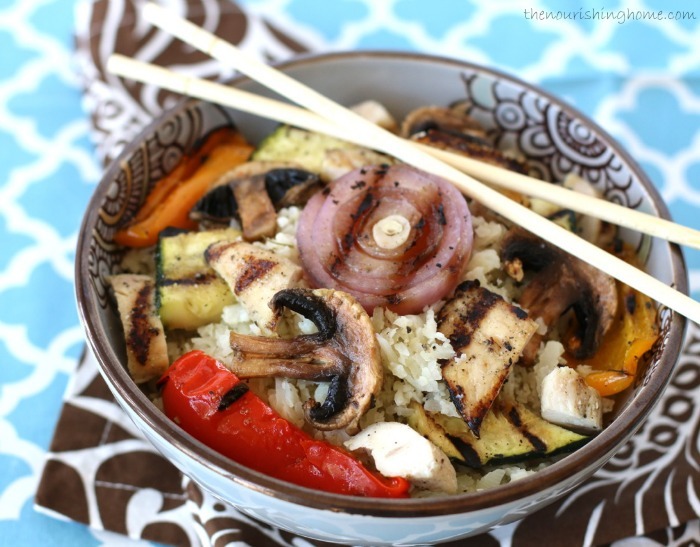 Use it as a base for your favorite stir fry. Or serve it alongside your favorite grilled meats, poultry, fish and veggies. P.S. The lovely napkins featured in these photos are courtesy of my friends at Hen House Linens. I just adore their beautiful table linens, and even more so, their mission to make mealtimes special by adding a touch of warmth and beauty to the table. 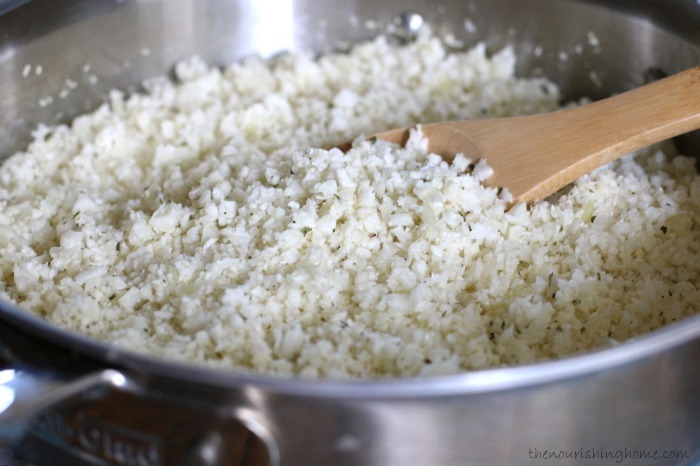 Cut the cauliflower into florets, and then use a food processor to pulse the florets into rice-like grains as described in the above photo tutorial. 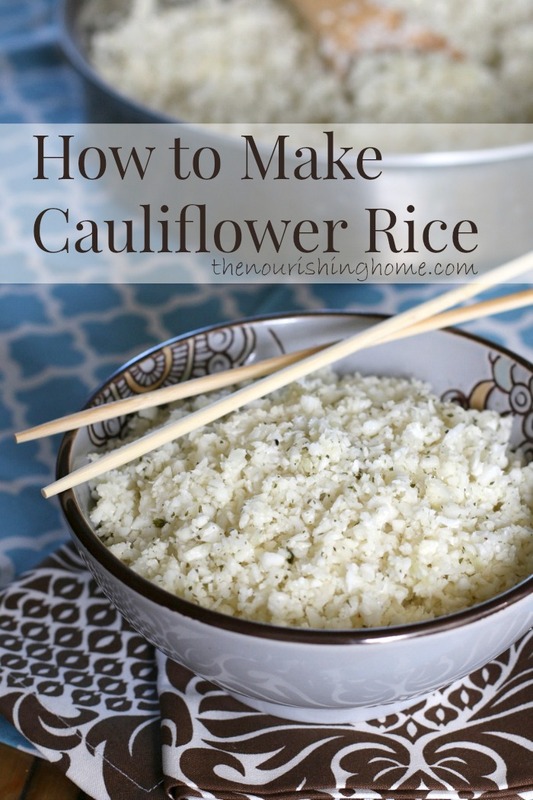 Set riced cauliflower aside. Remove cover, add the minced fresh parsley and fluff cauli-rice to combine. Makes a tasty and nutritious grain-free “rice” dish to serve alongside your favorite healthy meals. 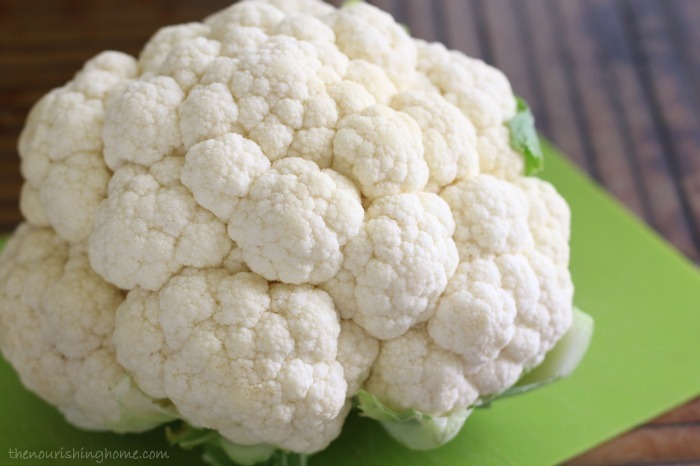 Time Saving Tip: You can process a head of cauliflower into rice up to 3-4 days in advance. Store the uncooked cauli-rice in an airtight container in the fridge until ready to cook. Cooked rice should also be stored in an airtight container in the fridge and generally tastes great for up to 2-3 days. However, I do not recommend freezing uncooked or cooked cauli-rice, as it becomes mushy. For even more delicious cauliflower rice recipes, I highly recommend picking up a copy of Meals Made Simple by Danielle Walker. It’s truly one of my favorite grain-free cookbooks, and it’s what finally convinced me to give cauli-rice a try. Yum! We love cauliflower rice. 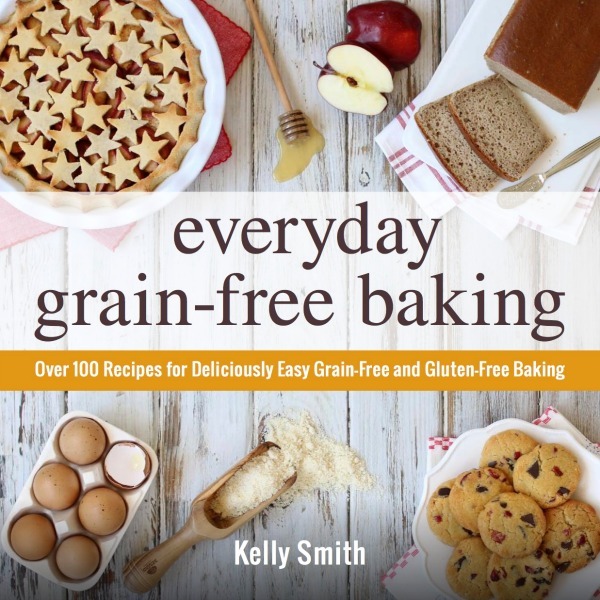 It’s a great grain-free alternative. Thanks for sharing. My pleasure! I agree. It’s definitely a wonderful way to enjoy “rice” without the rice. 🙂 LOL! I have everything on hand right now! Can’t wait to try! 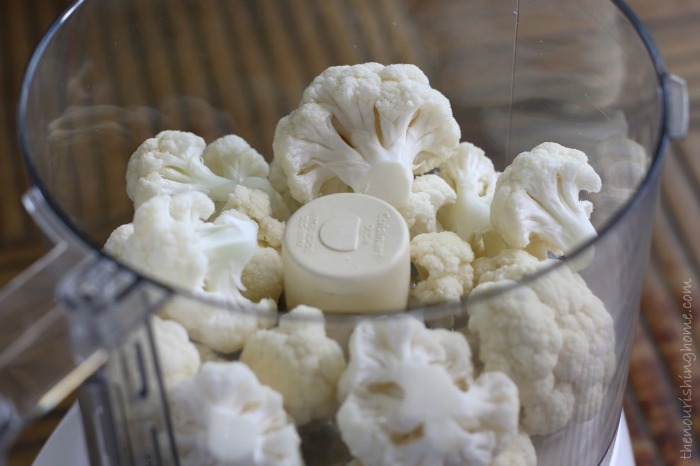 When I first heard of cauli-rice a few years ago Iwas sceptical – but I tried it – however I was told to hand shred the cauliflower with a knife!! It ended up all over my kitchen!! Since then I have used a similar method to yours with far more success – it can be microwaved too but needs fequent stirring and care or it will go to mush at the bottom and sides of the dish and be hard in the middle. I certainly agree with you that its a useful dish that can so easily be varied to suit the other dishes in the meal. Wow, Ann. I cannot imagine the mess of trying to fine-chop cauliflower. Just coring it and separating it into florets can result in those tiny little pieces flying everywhere 🙂 Thank goodness for food processors! 🙂 Thanks so much for sharing! 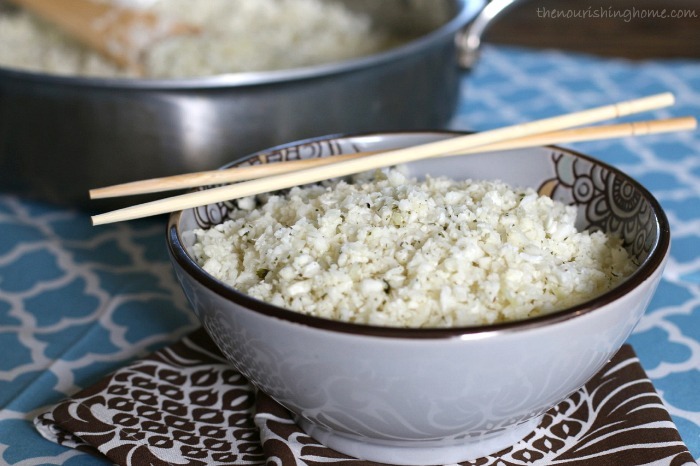 You MUST try the blender method of making cauliflower rice! It’s life-changing, trust me. I’m posting the link to the video below, but all you need to do is cut the cauliflower into chunks, like you showed, put as much at a time as will fit in your blender, add water to the line, pulse for 30 seconds or so, then drain in a fine mesh strainer. So easy! I have a 3 cup food processor, and making cauliflower rice in it was a half hour of frustration for me, and then I stumbled upon the blender method. I even use my smoothie blender for it, and it works like a charm. When am I supposed to use the olive oil? Can’t wait to try! Is there any way this can be made without the butter & olive oil? Ie. Pam cooking spray or spray butter? Thank you for the fantastic recipe! How long will this stay good on the fridge? I woul only make up a serving or two at a time . I just made this. SOOO good!!! Perfect side dish. I used a yellow/orange cauliflower, and it made such a pretty dish. Thanks.